Mayor Eric Garcetti’s office gave area photographers were a tour of the Crenshaw/LAX Line yesterday. 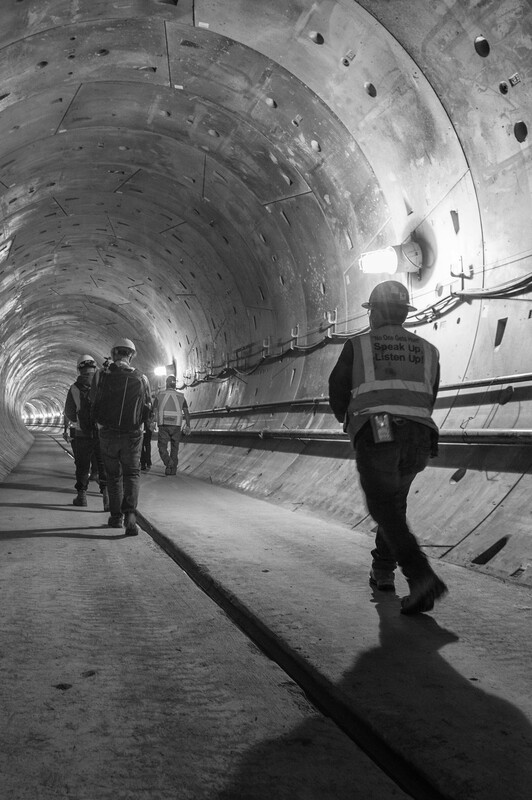 This photo was taken in one of the twin rail tunnels between the future MLK Station and Leimert Park Station. Photo by Steve Hymon/Metro. 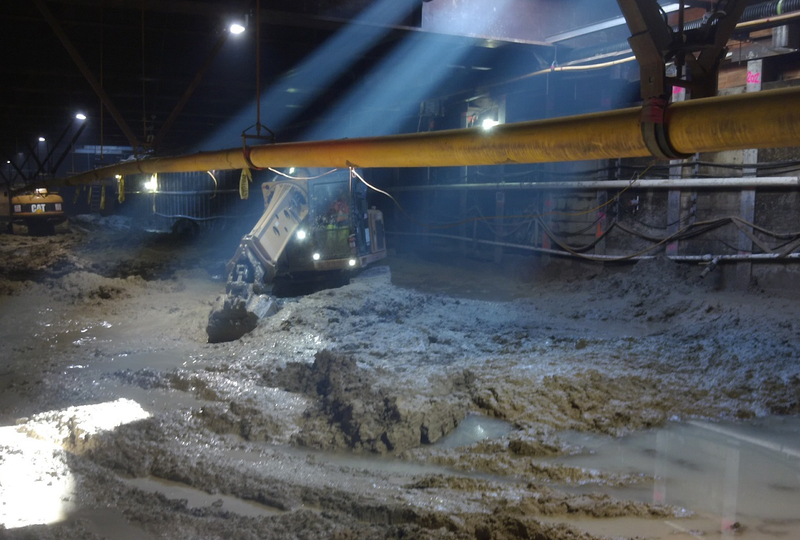 Work beneath Wilshire Boulevard on the future Wilshire/La Brea Station for the Purple Line Extension project. Photo: Metro. The Westwood VA Station will be near Bonsall Avenue. Credit: Google Maps. During his campaign for Los Angeles Mayor in 2005, Antonio Villaraigosa called for building the subway to the sea. It was a popular idea, albeit one that lacked one penny of funding. In my former job — covering City Hall for the LAT — it was often quite fun to remind the mayor and his staff of this small inconvenience any time they got too mouthy about the subway. Ultimately, however, Villaraigosa produced. Measure R was approved by county voters in 2008 and provided the funding needed to extend the subway for nine miles to Westwood (Measure M supplies the money to accelerate the project so that it’s done by 2024-26 instead of 2036). That, I think, was a monumental achievement. There just wasn’t — and still is not — the funding or political support to extend the subway west of the VA Hospital. Beyond that, the question appears to be whether the Purple Line does anything that Expo can’t do, and whether Los Angeles can support two lines connecting downtown Los Angeles and the beach. I would argue that the answer is yes to both questions. The east-west travel demand in this part of town is enormous and diverse. Though the end points are similar, each line serves areas separated by several miles and likely to develop distinct ridership bases. To me, the more relevant issue is that the Expo Line may actually be ill-equipped to handle expected traffic if the final Purple Line segment is not completed. By the early 2030s, the Sepulveda Line will likely be open between the Expo and Orange Lines. When that happens, the Expo/Sepulveda station will turn into a pressure point with the potential to regularly overwhelm Expo’s capacity. Good points. And I would add that the Crenshaw/LAX Line — projected to open in 2019 — will also add ridership to the Expo Line given that Crenshaw’s northern terminus will be the Expo/Crenshaw Station. As for the subway going west of Westwood…time will tell if the support materializes. The reality is that with all L.A. County residents paying Metro sales taxes, transit projects are being built around the county, as I think is appropriate. That said, I do think there is one urgent issue with the subway. That last station will be in front of the VA Hospital, about a half-mile from the many residences and businesses just west of Federal Avenue. I do think that with Measure M accelerating the subway, it’s important right now to plan on getting people to that station whether by bus, bike, foot or car. The study is from Smart Growth America, a group that advocates for (among other things) more transit and less autocentric policies. The gist: five residential developments next to transit were found to have too much parking while also producing at least 30 percent fewer car trips. Why? Perhaps because the residents lived near transit or in neighborhoods with plenty of ways to get around. It’s an important topic because critics have often said that adding density near transit results in more traffic. That, IMHO, doesn’t quite tell the whole story as such developments may result in more walkable neighborhoods, more housing closer to the city center and, yes, more people to ride transit. All things to keep in mind because these type of issues may soon be coming to a ballot near you! Don’t forget to look at the pics. Among the issues found by this reddit user and commenters: cars (read: a Hummer) using more than one space, cars parked in motorcycle spaces and none of the permit spots coming available after 10 a.m. There are also pics of some cars receiving citations for using the permit spaces without having a permit. The idea of the parking fee is to help free up spaces so there will always be some available at all times of day. You need to have a valid TAP card to qualify for the fee; that’s designed to discourage people from using Metro parking lots who aren’t taking transit. Officials at Seattle-area transit agencies say they are putting protocols in place to ensure that there’s a sound reason to shut down transit service — a reason beyond stymying a protest. Police asked for light rail to the Seattle airport to be halted because, police said, they were trying to get crowd control measures in place. The CEO of Sound Transit ordered the service to be restored once he found out what was going down. Some found rides. Some waited for buses. And some, including Amy Gore of Seattle, walked the 45 minutes to the airport to express their First Amendment right to assemble and protest. “Public transportation belongs to everyone, and it shouldn’t be used as a way to limit access or silence dissent,” Gore said. I think extending the purple line to compliment service on Expo would be great. Not everyone that lives along Wilshire should be forced south to reach downtown by expo in my opinion. EW Traffic is already a nightmare and will continue to get worse. Not to mention, there is a certain benefit to having service where if I am in Westwood, I could take the subway west to say 26th, run and errand, hop one back west to DTSM (Id make purple and expo transfer point; pie in the sky, I know)… And Lets just say I decide to go to Westside Pavillion to get my watch fixed… Well, I have the freedom to do that along the line without really ever using the road. Although the service is a double back situation, this is never a concern in say NYC since geography is 3d there in the sense that the surface routes and times are much different than underground. Coincidentally as well, even though tunnels can get you from point a to point b the fastest, that savings in time does allow you to physically go a further distance to a destination. A good example is USC from Wilshire Vermont…. Certain times of day Vermont is the ticket, and on others Red or Purple to Expo. The campus is so large that depending on where you need to be, a let off at Vermont could add a 20 minute walk to your trip. So if I live or work at Bundy and Wilshire, I say yes, build the line. Id take a train west from there, transfer to Expo and go to Culver City. One transfer, a dedicated right of way, and what should be service I could set my watch to. Id imagine that trip taking a half hour to 35 minutes. Psshhh Crenshaw LAX would be open by then too; game over. I’d agree that it is a shame and an oversight that Measure M did not fund the subway to get to at least Bundy. The VA is a horrible terminus in that it is not accessible from the North or South as the VA is a closed campus and not on the street grid. That leaves Wilshire Blvd. as the only way to reach that station and Wilshire right here next to the 405 is horribly clogged much of the day. The Purple Line Station is going to be constructed almost right next to the 405 South Bound on ramp. Bundy would serve the high rise businesses in the neighborhood as well as the apartments and other places like University High School. Also, it would be an easy connection on the 14 BBB to the Expo Station a mile to the South for connectivity between the two lines. The VA Station cannot be connected so easily to the Expo Line at all. Build it. It is not uncommon for train lines to parallel this closely in many other dense cities. That is a very busy region and corridor, especially due to the high number of visitors and tourists to that area. I do think that if Santa Monica wanted this, they would need to agree to more density at least along the Wilshire corridor. The current projected line should always have been at least to Bundy in the City of LA rather than stopping at the Vet Hospital. 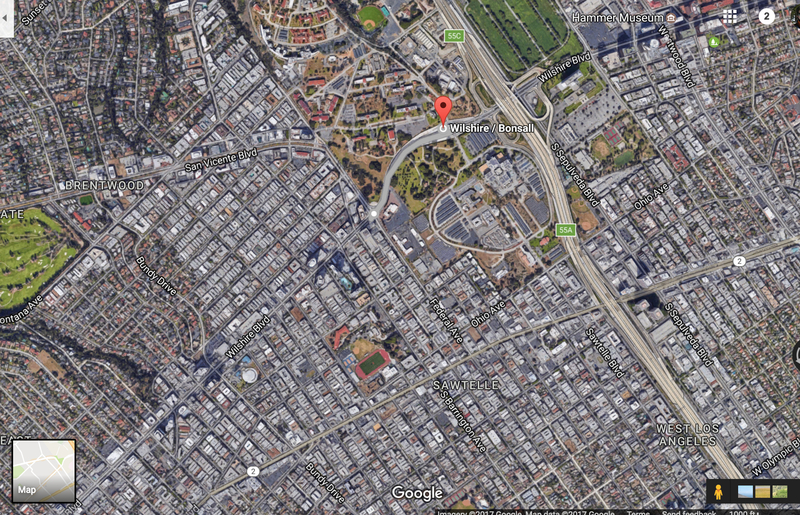 That area or Wilshire and Bundy has the towers and density to have deserved it. The reddit user does mention taking the bus – and it looks like he’s learned the hard way that driving isn’t necessarily the best bet anymore these days. If limited parking forces people onto the buses, perhaps that’s a good thing. Complaints about parking on social media, like this guy’s post, give the issue the publicity it needs (and implicit advertisement for the bus system). The big question it’ll raise for everyone, of course, is if it saves money over driving. If this reddit guy were to commute using both the Burbank Bus and Metro (assuming just one person), he’d be looking at around $100 a month for a 5 day/week job, if I did the math correctly with the transfer fees. At that rate, you might as well spend a few more bucks for an EZ Transit pass. That might still be higher than the average driver’s current monthly gasoline costs for a commute of that distance – so an interagency commute might not be worth it. Carpools, though, are definitely the cheapest option per person. The cost of driving isnt in the gas, it’s the mechanical wear and repairs on the car. The IRS says the cost of operating an average car is 54c/mile. Gas is only 12.5c/mile — assuming $2.50/gal, 20 mi/gal. I wonder if there would be some way to have the Purple Line intersect with Expo at a point before Downtown Santa Monica to allow a transfer, but then have the Purple Line still swing north to head to Sherman Oaks. Yes, I know that the plan is to have the currently-named “Crenshaw Line” cross to the Valley, but remember that buses would also be able to take riders to Santa Monica from my proposed transfer station (as well as from the Wilshire/VA terminus). Building a Purple Line extension to the beach is a must. There is the demand for it now. The Expo Line will be insanely crowded when the Crenshaw line opens. Which experts? Expo is already exceeding ridership expectations. I haven’t seen a single person comment that Expo will be able to handle the increased crowds from the Crenshaw Line given the already elevated level of ridership on Expo, but feel free to post those analyses. Eliminate the mid Santa Monica stations, keep Wilshire/Bundy and call it Brentwood, then nonstop to the Wilshire/4th terminus of the Purple Line. Add speed and reduce cost. The Expo terminus in Santa Monica has very high ridership. Kudos to Metro for helping protesters exercise their rights, rather than trying to obstruct them. I’d say no and prioritize it lower, (unless they concede to build it as elevated at a huge price cut) it doesn’t expand the overall reach of the Metro Rail network the way Gold, West Santa Ana Branch, Crenshaw Line, Green Line to Torrance, the Van Nuys Blvd LRT, and Gold Line to Whittier have/will. The Sepulveda pass project will also link to Expo (already operating to Santa Monica) to maximize its usefulness. At worst, Purple Line riders will have to make a transfer to get to the beach by light rail or BRT. I’d rather see a Metro Rail project get poor and middle income people to work everyday than a second and more expensive and fully grade-separated project get brought to an affluent city that probably isn’t paying a proportional share of taxes for construction and operation to the detriment of expanding the reach of the overall system to places like the Vermont corridor in South LA (one of the most overburdened bus routes in the County). This is very true. I would take extending the Red Line down Vermont to at least Expo ahead of the Purple to the Sea if I could choose.Only thing is that the Subway to the Sea was used as a way to gain a lot of attention for this project and Measure R, but its almost like everyone forgot because of Expo. I can remember the lot on NE corner of Barrington and Wilshire being just dirt and thinking “it would be great if the Purple at least got here, and thats a perfect plot of land for a station. Buy it Metro, please.” Its condos now. The VA is not the best place to complete this line, and heck even if not to the beach, its not too far south to Lil Osaka where there is at least a lot of activity and gridlock at Santa Monica Blvd. before any new lines are built to handle extra capacity, seating arrangement needs to be improved and better rolling stock acquired as a means of increasing capacity. Switching from Chicago to New York-style seating arrangements in particular is a cheap way to do just that. Not too many people talking about biking to a station which is rather disappointing because if you can drive to a station and you don’t have a disability, you can probably bike to one too. It would be super expensive project and would take so long to complete it. Although this city do need it. The expo line serves areas much further south than the purple line does so this would NOT be a duplication of service. Both are needed and the west side density and/or travel demand supports it. One line goes through UCLA/Westwood area, Century City, Beverly Hills, Mid City etc. and the other goes through Culver City, South LA, USC etc. until they both meet in Downtown LA. The Crenshaw line will probably add strain to the expo line but will disperse a bit once its terminus is extended north to the purple line and then on to Hollywood/Highland via West Hollywood.